Well, my interest in radio started sometime in my teen years. That would be the mid 1970's when CB radio was popular. My Dad got me started there, and I got to know a few local hams who spent time on CB. I saw a demo of Ham Radio given by Ron W9EOA at the JR High I attended which peaked my interest also. It wasn't until 1984 however until I earned my Novice ticket thanks to the prodding of a local ham named Jim Theisen. He told a few friends and myself that he would be giving us the Novice test on a certain date, so be ready. The rest is history. I upgraded to Tech in April of 1984 by being involved in the first Volunteer Examiner testing session ever given for higher than a Novice Class in Dayton, Ohio. I upgraded to General in Sept of 1984, and finally to Extra in 2004. My current station consists of equipment I could only dream of having when I was first licensed. I still have the Drake C-Line ( T4XC/R4C ) that I purchased in 1985. My other HF equipment consists of a Yaesu FT-1000 MP Mark V, a TEN-TEC Orion II, and a Yaesu FT-847 which I mainly use on VHF/UHF. I also have 2 HF amps, an Ameritron AL-1200, and an Alpha 87A. I was fortunate enough to find a used US Tower 72 ft motorized crank up tower in good shape which will be put up in 2009 along with a Force 12 5BA beam, and a 2 element 40 meter beam. I enjoy many aspects of Ham Radio from rag chewing with people to working DX. I'm still fascinated by the fact that you can take a radio, a piece of wire, and work the world. It's a great hobby, and I've made a host of great friends due to Ham Radio. When I am not on the radio You will find me in one of the family owned tow trucks. 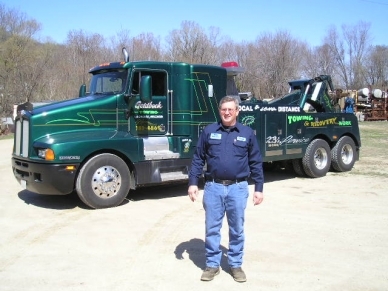 My Father and Mother started the Goldbeck Towing Co. over fifty years ago and my brother and I are still hooked on the family business. Dad just can't seem to retire, he will accompany me on many of the local tow calls. So if you happen to see one of the big green trucks going down the highway wave but don't call N9ETD as there isn't any ham gear in the business vehicles. 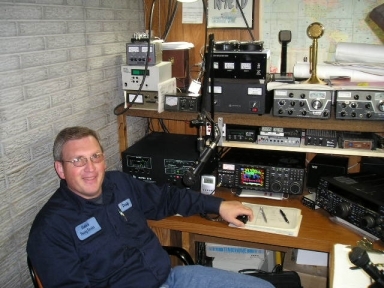 All of his life Craig, N9ETD has dreamt of having a “Big Time” ham radio tower in his backyard but there has always been some obstacle shattering that dream. That all changed in the fall of 2008 while picking up an amplifier purchased from Richard, NJ9K. Richard mentioned that his 72 foot freestanding crank-up tower was for sale as well. After hours of soul searching, consulting with friends and family plus a home plot evaluation Craig purchased the tower. With help from his MVARA friends Craig’s dreams are coming true as he takes down the crank-up, hauls it home and plants it in the backyard.